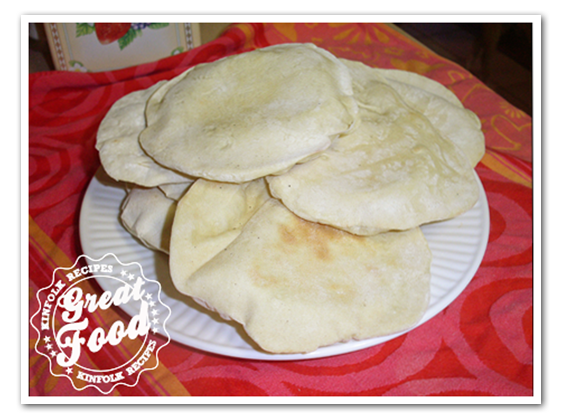 Pita is a round pocket bread widely consumed in many Middle Eastern, Mediterranean, and Balkan cuisines. It is prevalent from the Balkans through Turkey, the Levant and the Arabian Peninsula. 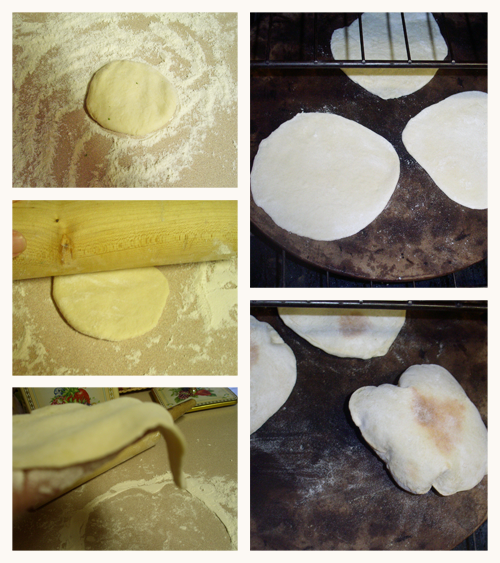 The “pocket” in pita bread is created by steam, which puffs up the dough. As the bread cools and flattens, a pocket is left in the middle. This bread is served with every meal and makes for great sandwiches. 1. Mix the yeast, sugar and 1 cup of warm water (110F) and let it sit for 10-15 minutes, or until bubbly. If it’s not bubbly by then the yeast is not working, start all over again. 2. 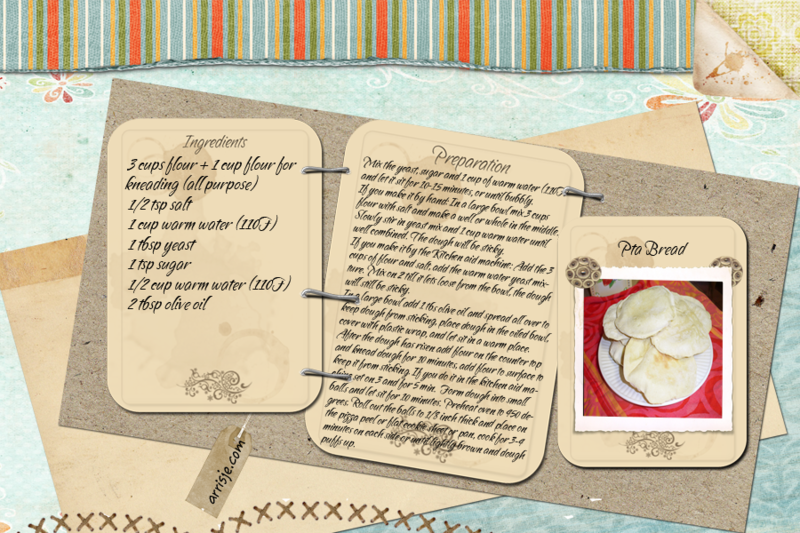 If you make it by hand: In a large bowl mix 3 cups flour with salt and make a well or whole in the middle. Slowly stir in yeast mix and 1 cup warm water until well combined. The dough will be sticky. 3. If you make it by the Kitchen aid machine: Add the 3 cups of flour and salt, add the warm water yeast mixture. Mix on 2 till it lets loose from the bowl, the dough will still be sticky. 5. After the dough has risen add flour on the counter top and knead dough for 10 minutes, add flour to surface to keep it from sticking. If you do it in the kitchen aid machine set on 3 and for 5 min. 6. Form dough into small balls and let sit for 10 minutes. Preheat oven to 450 degrees. Roll out the balls to 1/8 inch thick and place on the pizza peel or flat cookie sheet or pan, cook for 3-4 minutes on each side or until lightly brown and dough puffs up. 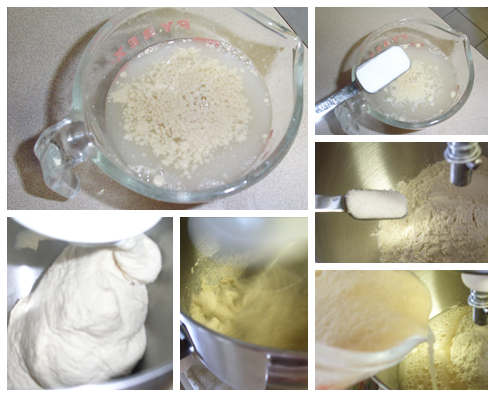 Mix the yeast, sugar and 1 cup of warm water (110F) and let it sit for 10-15 minutes, or until bubbly. If it's not bubbly by then the yeast is not working, start all over again. 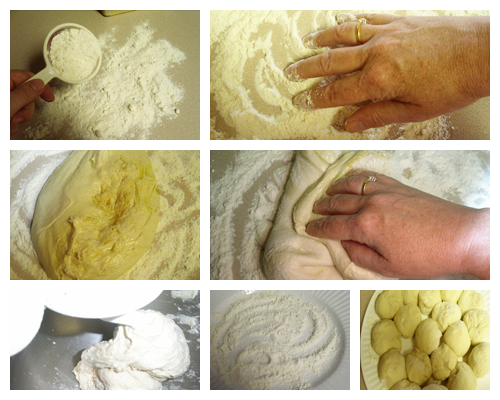 If you make it by hand: In a large bowl mix 3 cups flour with salt and make a well or whole in the middle. Slowly stir in yeast mix and 1 cup warm water until well combined. The dough will be sticky. If you make it by the Kitchen aid machine: Add the 3 cups of flour and salt, add the warm water yeast mixture. Mix on 2 till it lets loose from the bowl, the dough will still be sticky. After the dough has risen add flour on the counter top and knead dough for 10 minutes, add flour to surface to keep it from sticking. If you do it in the kitchen aid machine set on 3 and for 5 min. 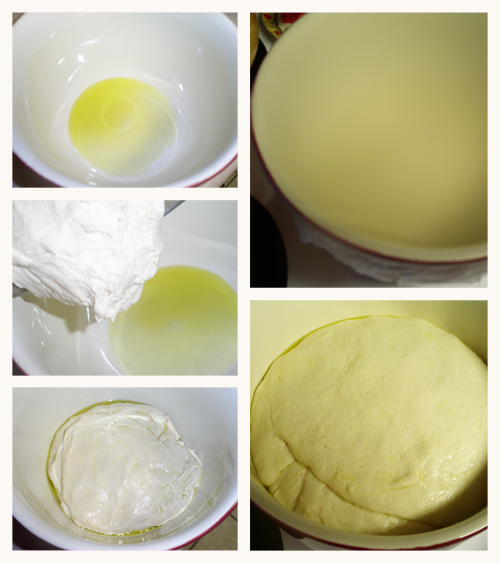 Form dough into small balls and let sit for 10 minutes. Preheat oven to 450 degrees. Roll out the balls to ⅛ inch thick and place on the pizza peel or flat cookie sheet or pan, cook for 3-4 minutes on each side or until lightly brown and dough puffs up.